Today I want to share with you one of my favorite recipes that my mother taught me to make when I was just a mere child. 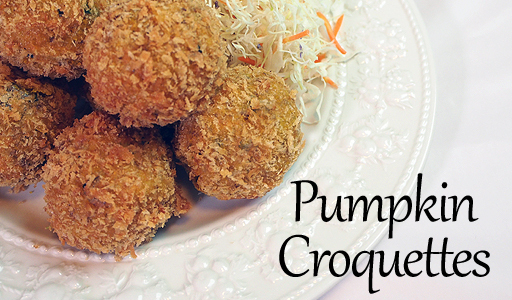 Presenting the Pumpkin Croquettes a La My Mother! She makes croquettes the Japanese way, which is why it's usually pronounces Korokke. However you pronounce it, these deep-fried balls are simply delicious! Cut the pumpkin into 2-inch blocks. Place your pumpkin pieces in a bowl. Make sure your bowl is safe for the microwave. Cover with plastic wrap. Cook in the microwave for 6 minutes or until they are soft. While your pumpkin is cooking, fry the ground meat in a frying pan until no longer pink. Season with salt and pepper to taste. Set aside. Mash up your pumpkin with a fork until crumbly with no large chunks. Add butter and ground beef and mix well. Add salt and pepper to taste. Put a fistful of pumpkin mixture into your hand. Roll it into a ball. Press in the center with your thumb to make an indent. Take a little cream cheese and place in the center of your pumpkin ball. Cover it with some pumpkin mixture. Make sure the cheese is completely covered. Mold it into a nice ball. Break one egg into a bowl and whisk with a fork. Put your pumpkin ball into the flour, rolling it around to cover all side. Then put it into the egg wash. Then cover it with panko bread crumbs. Repeat until completed. Make sure they are completely covered with the bread crumbs. Heat oil to 180C/350F. Cook the croquettes until golden brown, turning occasionally to ensure an even color. Place on wire rack or paper towels to drain excess oil. Eat while hot. Enjoy them as is, or with some tonkatsu sauce. My favorite sauce for these croquettes is made with 1 part ketchup and 1 part mayonnaise. It's a super simple sauce but so good with these. 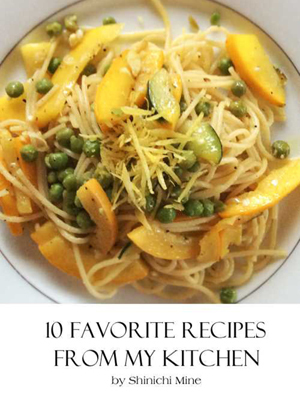 I really hope you like today's recipe as it surely is one of my favorites! Make sure to check out my video tutorial for this delicious recipe.